If you’re looking to buy a new graphics card, precisely a GeForce GTX 1080 model, the first thing you’ll notice is that there are a lot of different brands out there. Instead of spending hours on researching which one is the best GTX 1080 card, make use of our list and find the perfect version for yourself in no time. The provided list contains all the exceptional GTX 1080 graphics cards we’ve tested, enjoyed, and which we now recommend to you. No matter whether you want a GTX 1080 version with the best cooling, overclock capacity, customer support or simply to make most of your budget, all of these cards deliver an impressive performance worth their price. Based on Intel Pascal, the GeForce GTX 1080 GPU delivers two times the performance and three times the efficiency than Titan X and 43% more memory bandwidth than the GTX 980. The GTX 1080 specs include 8GB GDDR5X memory at 10Gbps speed with a minimal guaranteed boost clock of 1733Mhz, depending on the model. As NVIDIA GTX 1080 cards automatically overclock towards their boost clock value depending on the temperature, take note of cooler type and measured heat as well as overclock capacity for the smoothest performance, but more on that later. In the following best GTX 1080 brand comparison, you can pick your new graphics card with certainty according to your budget and conditions while the Nvidia GTX 1080 Founders Edition is simply here for contrast purposes. The Nvidia GTX 1080 FE was the very first GTX 1080 released for those who were impatient and is nowadays rather impractical in comparison to the other, newer models. To complement your new GPU with a new monitor for a complete visual pleasure in gaming, check out the best gaming monitors available as well. Recently, there was a significant GTX 1080 price drop of up to $100, making them much more affordable and appealing. The Gigabyte GTX 1080 G1 Gaming graphics card is one of the finest GTX 1080 cards under 500 USD. It features three fans which are surprisingly silent even under heavy load and remain inactive under 60ºC while the temperature doesn’t exceed 72 ºC overall. Moreover, it offers a generous 1860Mhz boost clock and 1721Hz base clock which you can further overclock to around 2Ghz depending on the game while the memory speed is overclockable to 11Gbps, as it’s the case with the most of NVIDIA GeForce GTX 1080 brands. 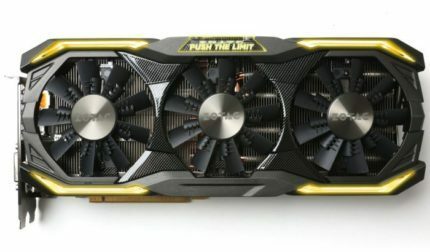 The Zotac GTX 1080 AMP! 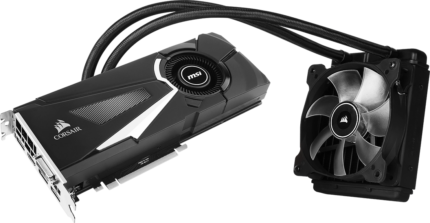 Extreme is the best GTX 1080 graphics card out there regarding overclocking as it’s capable of reaching up to 2140Mhz. In addition, it has a native boost clock value of 1911Mhz. The boost clock value is determined as the maximum safe point by the manufacturer and the card will automatically overclock itself as long as the proper temperature is maintained. With the Zotac GTX 1080 AMP! Extreme there is no issues regarding overheating as the triple fan effectively cools the device. Idle temperature amounts to 39ºC while maximum temperature under pressure doesn’t surpass 73ºC. Fans are exceptionally silent at around 38 dB(a). However, there’s only a two-year warranty. 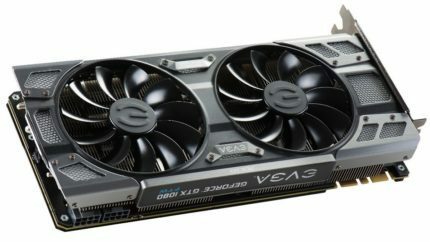 When it comes to customer support, there’s no better than EVGA as they’re known for their flexibility for warranty, specific deals, service, etc. Among other things, the EVGA GTX 1080 FTW Gaming ACX 3.0 also offers exceptional performance at 1860Mhz boost clock with silent dual fans and effective cooling as well as double BIOS. In short, the double BIOS feature allows you to have an extra backup BIOS for overclocking. It’s a great safety feature if you plan on overclocking. The ASUS GTX 1080 ROG STRIX features two HDMI 2.0 ports which allow you to simultaneously connect your Virtual Reality headset and the monitor without any extra converters. Moreover, it delivers a superb performance with no throttling due to the 1835Mhz boost clock value that is effectively cooled by triple fan system with an innovative 0db technology for inaudible operation while idle and barely hearable fans under pressure. The ASUS GTX 1080 ROG STRIX also includes an eye-catching Aura lighting system which you can configure as much as you’d like and incorporate with other ASUS Aura-compatible devices. Although one of the most expensive GTX 1080 graphics cards, the MSI GTX 1080 Sea Hawk delivers the smoothest performance with its simplistic-looking yet fascinating design with liquid cooling. Additionally, it features 1847Mhz boost clock value and 8192 GDDRX5 VRAM. Besides featuring the most advanced cooling system, this graphics card is also the quietest GTX 1080 available. The other GTX 1080 cards from MSI brand such as the MSI GTX 1080 Armor OC and the MSI GTX 1080 Gaming X deliver flawless performance as well due to effective cooling which may not be as efficient as it’s with the Sea Hawk version, but it makes them much more affordable. 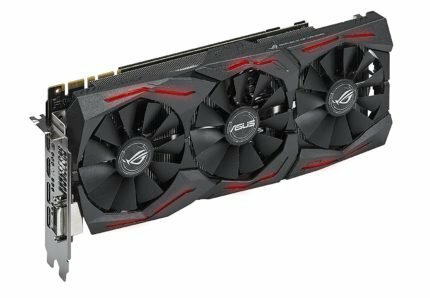 Based on numerous GeForce GTX 1080 reviews, MSI is among favorite models. Besides making sure that your new graphics card will fit onto your motherboard and in your PC case, make sure you have a powerful enough PSU (Power supply unit) as GPUs with 8 + 6/8 pins require additional power connectors. Another important factor regarding the temperature of the GPU apart from its cooling system is to maintain proper airflow within the PC case. Better cooling allows the graphics card to more effectively overclock towards its boost clock value. Besides, proper airflow affects the performance of all your PC components within the case, not just GPU. When manually overclocking via the provided software, make sure not to overstep the boundaries even though most GPUs default software prevents a risky increase in voltage. With proper overclocking, you can easily boost the performance by 5 – 10% which is quite sufficient. Keep in mind that most warranties don’t cover damage caused by irregular manual overclocking, though some actually do such as EVGA. If you plan on overclocking your card as much as it can handle, opt for the double bios cards. In order to use the full potential of your NVIDIA GeForce GTX 1080 GPU, consider G-Sync monitors. As GTX 1080 is G-Sync compatible, you can use it with G-Sync monitors and synchronize the GPU’s frame rate with the monitor’s refresh rate and thus enjoy smoother gameplay experience with no screen tearing and stuttering within the dynamic range. Whether you plan on playing at 4K resolution or at 1440p with high refresh rates, the GTX 1080 along with G-Sync delivers the smoothest gaming experience. In the GTX 1080 comparison chart below, you can find the most suited brand for your needs. Rest assured that you can’t make a wrong choice as all of these have shown impressive performance considering their price. Disclaimer: Clicking on a product name will redirect you to amazon.com (co.uk, .ca, .de, .it, .fr, .es, etc.) depending on your location.